Did the Peacock Throne of the Mogul of India sink with the Grosvenor? This edited article about treasure hunters first appeared in Look and Learn issue number 483 published on 17 April 1971. The Grosvenor’s captain thought he was several hundred miles from land, and the mate took no notice of shouts from the men up aloft that they could see lights ahead, lights which later turned out to be bush fires on the coast of Pondoland in South Africa, about 135 miles south of where the city of Durban now stands. When land was finally sighted it was already too late. 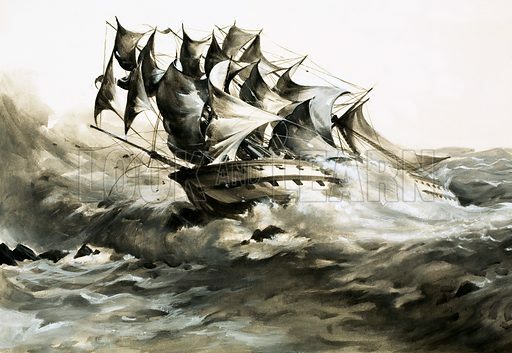 At 4.30 a.m. on 4th August, 1782, in a rising gale, the Grosvenor ran headlong on to the rocks. She heeled over and began to float off, but was held firmly by the jagged reef that had destroyed her. She carried 138 people. Nearly all of them, including a handful of passengers, men, women and children, managed to scramble ashore. They were without provisions or weapons, and their attempted trek to the Dutch settlements 250 miles to the south ended in death from starvation, exposure and the spears of hostile tribes. Only five tough sailors got through to bring news of the disaster. The Grosvenor had been an East Indiaman, one of the fleet of great ships belonging to the East India Company, which, by this time, had made Britain the ruling power in India. The Company’s ships used to return laden with the wealth of the Orient; everything from silk, spices, coffee and tea to precious stones. The Grosvenor had set sail from Ceylon in June with a cargo of general merchandise plus coins and diamonds about £80,000 in value. This sum would be worth far more today, but it was not a colossal amount by treasure-ship standards at that time. This must be borne in mind in view of what happened later, which is a classic example of the way in which fact becomes legend in the exciting but greed-obsessed world of the treasure-hunter. The Dutch settlers sent a relief expedition to find survivors of the Grosvenor, even though Holland was at war with Britain in 1782, but none was found. Another expedition in 1790, this time to find three women survivors rumoured to be living in a Kaffir village also failed. All they found were five cannons, a few pieces of iron ballast and some porcelain. Almost a century passed. Then, in 1880, an expedition sailed to the site of the wreck, spurred on by reports of gold coins being picked up in the area by a Captain Bungay. The Grosvenor’s hull was still on the rocks, and, using dynamite to help them, the salvage team, led by a man named Turner and a Lieutenant Beddoes, recovered some gold and silver coins and a few other valuables. They also found nine cannons lying among the rocks, and local Kaffirs told them of a box of treasure rumoured to have been buried on the coast by the survivors of the wreck. Before he left, Turner drew a map of the site of the wreck, a copy of which came into the hands of Alfred Raleigh of Durban, who persuaded a man said to have second sight to visit the wreck with him. The man went into a trance and saw 22 boxes of gold, but, alas, they were never found! From then on the hunt was really on, though nothing turned up at first except a few coins. Then a sensational development occurred. No one knows who started the story, but around 1900 the word went round that the jewel-encrusted Peacock Throne of the Mogul of India was aboard the Grosvenor, together with his Imperial regalia. Actually, the throne was – and is – in Tehran in Persia. It was looted from Delhi by Persians in 1739, and the Shah of Persia still officially sits on the Peacock Throne. Two golden peacocks, their wings outstretched, are behind the seat. But there is no stopping a treasure rumour and suddenly the wreck of the Grosvenor seemed one of the most exciting spots in the world. The first major expedition to find these new treasures was in 1905, but the wreck had now disappeared in the sands. A dredger was hired, but when a diver was drowned the search was abandoned. The First World War held up operations, then, in 1921, the Grosvenor Bullion Company was formed. It was proposed that a tunnel should be dug under the sea-bed to reach the ship’s strong room which now was alleged to contain nearly ¬£2 millions! The Company’s prospectus even listed items like 720 gold bars and 19 boxes of precious stones, claiming that “old manuscripts” had been found in the India Office in London about these treasures. It was all pure fantasy, but the Company raised the money it needed! Next, news of the Peacock Throne got into print and so did the discovery of the alleged ship’s log of the Grosvenor. The India Office denied all knowledge of either, but who cared? Certainly not treasure-hunters! The Bullion Syndicate started its tunnel, dug 280 ft. but with only 150 more to go ran out of money. A newspaper then whipped up interest by admitting that the throne was safely in Persia, but that the golden peacocks were in the Grosvenor still and worth over £2 millions. They were apparently safely embedded in concrete and in iron chests, so were quite safe! But the Syndicate ceased to function. The master story-teller, Conan Doyle, added to the legend by mentioning it in a book in 1923. He had heard it when in South Africa during the Boer War. Then an American millionaire named Pitcairn, who felt the peacocks should be returned to their rightful owners, reached a point 50 ft. from where the wreck was thought to be but never quite made it. In 1938, another company proposed to put a breakwater round the wreck, then build a dyke within it and pump the area dry, but the Second World War halted the project. In 1945, someone suggested a huge grab-crane to seize the wreck, but the same year Professor Kirby of the University of Witwatersrand flatly stated in an article that the Grosvenor was not a treasure ship. He even discovered that a forged document had been placed in a book in the British Museum to whip up public interest! Yet still the hunters went on, one actually finding a wreck in 1951, 450 yards south of where it should have been. Finally, in 1951 Professor Kirby wrote A Source Book on the Wreck of the Grosvenor, which should have finished off the myth for ever. But it is still being told, Peacock Throne and all! The Professor has rightly said that people prefer a mystery to the truth. Strangely, one man did find a fortune. In 1927 a prospector named John Bock found 1,038 diamonds on the beach near the wreck and was sent to prison for his pains. He reported his find and despite the evidence of experts that the diamonds were not typically South African – in other words they almost certainly came from India via the wreck – he was given three years for having placed stones where they were not normally found. As for his diamonds, they were confiscated. Whether these came from the Grosvenor or from the pockets of a passenger who brought them ashore will never be known. What is certain is that Bock was one of the unluckiest men in the whole history of treasure-hunting.